When cargo flights are delayed or diverted, it not only affects customers expecting freight, it also impacts airports handling the traffic. Sometimes it takes a domino effect of gate shifts to accommodate off-schedule or unexpected cargo flights. Such disruptions are not unusual at Memphis International Airport (MEM), one of the top 10 airports in the world in terms of cargo tonnage. “An airport’s role in moving cargo is essentially providing space and maintaining the runways to facilitate efficient cargo operations. Because of our high volume of cargo activity, MEM is able to accommodate significant air traffic at any time,” says Glen Thomas, the airport’s director of strategic marketing and communications. That said, Delta Air Lines is working to minimize disruptions. 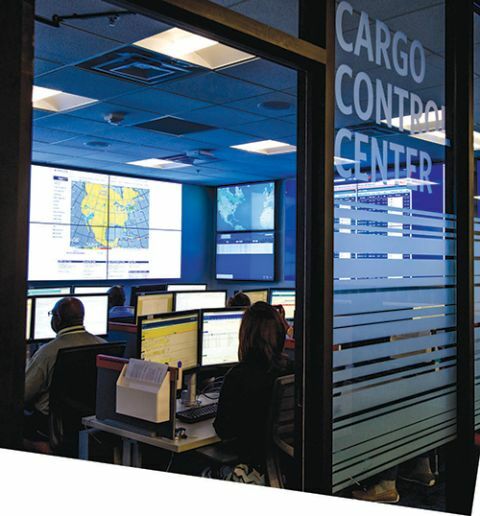 Last fall, the carrier opened a new Cargo Control Center at its headquarters in Atlanta (ATL) to keep airports and customers in the know. The new facility tracks air shipments, trucks, mail and freight—both domestically and internationally. Julian Soell, managing director of Operations and Customer Experience for Delta, notes that the new center is part of the carrier’s ‘Cargo Proud’ initiative. “We recognize that cargo is a critical part of our business, and it is important that we are proud of the business that we are in,” he explains. Part of that pride includes adding technology to manage the logistics of its cargo operations, while also striking a balance between technology and customer service. To accomplish this goal, Delta integrated employees from multiple aspects of its cargo operations together in its new facility. Centralizing cargo control functions in one location enables the airline to optimize operations in a way that could not be accomplished with various entities spread out in airports across the globe, Soell explains. • Service Recovery and Call Center Operations, with personnel who directly reach out to customers. Collectively, the team can view the individual elements of the shipment lifecycle and identify issues before they take place in order to provide proactive communication and support if there is a delayed or cancelled flight, explains Soell. “Having representation from all groups in one control center, even if they are using independent technology in their specific function, enables us to take care of things in hours instead of days,” he remarks. Delta’s joint-venture partner, Air France-KLM, also posts staff at the control center; and other partners, such as Virgin Atlantic and Air Mexico, may eventually join as well. “There’s a need to expand it, to have a broader reach,” says Soell. Having representation from joint venture partners on site helps Delta address problems more effectively as they arise. For example, if a shipment fails to make its regularly scheduled flight because the customer dropped it off late or encountered a weather delay, Delta can send the shipment on a later flight of a partner airline. When the center opened in October, it operated during business hours, Monday through Friday; but 24/7 operations began in January. With this change, the center now operates three shifts with about 40 total staff members. “Our customers work 24/7, freight flies 24/7, so we need our central command center to operate 24/7,” Soell remarks. “The new Cargo Control Center is the culmination of our significant investment in technology systems and operation reliability, all with the aim of enhancing the customer experience and ensuring that they are at the center of everything we do,” says Joyce. As Soell explains it, the facility leverages multiple types of software technology and analysis tools to turn the data it receives into actionable intelligence. Simply put, the center is designed to answer one crucial question: Where is my cargo? For instance, if Atlanta is experiencing severe thunderstorms, the center makes sure shipments are routed around Atlanta. If a hurricane is predicted in San Juan, it moves freight out before the hurricane hits. The new command center leverages technology to identify which shipments are on track and which need special attention. “Our software tools filter what our team needs to focus on,” he remarks. If the center’s systems indicate a delay, staff can proactively address the situation with shippers. “This ensures that customers never lose track of their shipments, and can make necessary adjustments on their end,” says Soell. The system is designed to improve operational reliability and, in turn, the customer experience by identifying bottlenecks and rerouting shipments as needed. Locating the service recovery and call center on-site enables Delta to proactively reach out to customers to explain how delays are being addressed. The center uses GPS (global positioning system) technology to track shipments sent via DASH, Delta’s flight-specific express service for small packages. Such shipments are given the highest boarding priority and fastest transit time of any Delta Cargo service, and the carrier puts a GPS tracker on every DASH package to enable real-time tracking. In the future, Delta plans to add RFID (radio-frequency identification) tags to some cargo shipments. RFID is already used to track baggage as it is loaded and unloaded from aircraft then moved to a baggage carousel. 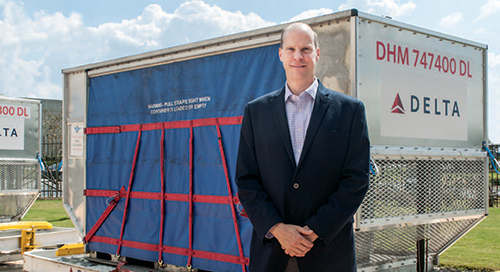 Soell notes that the contents of Delta’s cargo shipments vary greatly, and some have no room for delays. He cites the following case as one of many success stories the new command center has produced: Recently, a critical supply of human organs was being shipped on a connecting flight. When the first flight was delayed, the team at the cargo center received the information immediately and rerouted the shipment. Improving the customer experience is what led Delta to centralize its cargo management operations in the first place, he concludes.